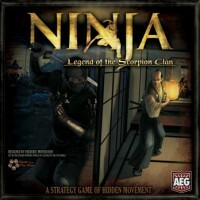 Designed by veteran game designer Fréderic Moyersoen, Ninja: Legend of the Scorpion Clan features fast play, hidden movement, limited information, bluff and guile. It is sure to challenge players and bring hours of enjoyment. Ninja marks a major excursion of the vaunted Legend of the Five Rings property into a board game format. L5R, as it is called by its fans, has become a staple of hobby gaming over its 16 years, thanks in large part to its loyal and devoted fans. It has won numerous awards for both its collectible card game and its role-playing games versions, and the property has also spawned novels and a miniatures game. 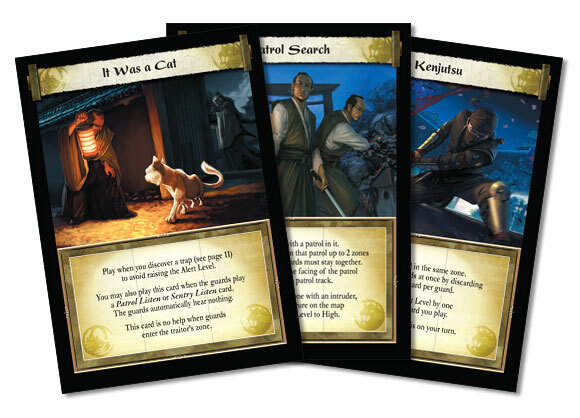 Ninja: Legend of the Scorpion Clan brings the depth and detail of L5R’s fantasy samurai world to board gamers in a fast-playing exciting, and accessible manner. The intruders move in secret, marking their positions on a small copy of the game board. They can move freely, but the faster they move, the easier they are to detect. Moats, walls, and most especially sentries all serve to hamper their movement. And if a guard stumbles across their position, the alarm will be raised! The guards must listen for intruders, search the area, and rouse additional guards when they think there’s trouble. All this is handled through the Alarm Level. As incidents occur, the Alarm Level rises, allowing the guard player to take more actions each turn. Over time, the Alarm Level gradually diminishes… until a new incident raises suspicions once more. All this is handled through card play, but deductive reasoning and intuition will also be required to find the intruders before they can complete their missions and escape. Although time and numbers weigh in the guards’ favor, the intruders have tricks aplenty. Climbing ropes, shuriken, drugged sake, and other tricks will distract the guards… or eliminate them completely. But of course, each such action may raise the Alert Level, as well as give the guard player a clue to your location. The guards have their own secrets, of course. The intruders don’t know the precise location of their mission targets, and while searching for them, they may stumble upon a nightingale floor that gives a telltale squeak, or even a hidden guard ready to slay any foe! Add a Review for "Ninja: Legend of the Scorpion Clan"